Do you love playing video games on your laptop, PC, or mobile? Games are something which can make everyone feel exciting, and it keeps us engaging all the time. If you get excited whenever you heard about a new launch of any software or tool related to gaming, then you must read out this article. We are sure that you will feel great to read about the Nintendo 3DS Emulator. 1.1 What is the benefit of Nintendo 3DS emulator? 2 What is Nintendo 3DS emulator? 4 How to download 3DS Emulator for Android? 5 How to use 3DS Emulator on Android? 3DS Emulators are becoming more and more popular, because of its so many features and benefits that it provides to the gamers. Even though, you can find some other emulators 3DS is more preferable as it offers remarkable performance. The 3Ds Emulator comes with all the basic needs to play various classical games like Ice Climber, Super Mario Brothers, Top Gun, Base Wars, Mega Man 2, etc. You can play all these games on various platforms like Android, iOS, and Windows very quickly and smoothly. If you are using the 3Ds Emulator, then there will be no disturbance in providing you with the best and most fantastic experience to play these ever-lasting and evergreen games. The best 3DS emulator will offer you a wide range of games to play efficiently. One such emulator is Nintendo which is the perfect solution that you can try when you want to make your game life more exciting even with the busy schedule that you are going through. What is the benefit of Nintendo 3DS emulator? Nintendo gaming emulator offers more fun and experience to all the new games. But purchasing is this emulator is hugely a costly option for most of the people. This is why people prefer investing in Nintendo 3DS emulator to experience the fun of all those Nintendo games. Nintendo 3DS was first launched in the market on 26th February 2011 in Japan. The beginning of this Nintendo 3DS was an experiment for testing the playing of the 3D video games in the year 1980s. The most popular game they have ever tried was the Mario Bros. Even though Nintendo was doing great, it failed drastically to impress its users along with making an impression in the market. This is where they started taking the Nintendo console seriously and decided to make the necessary changes in it. They made efforts to make it as the best gaming console, and then Nintendo became one of the leading gaming consoles in the market. It is effortless and straightforward to get access to the games. You can easily save, load, and play the Nintendo 3DS games anytime from anywhere you want to. The significant benefit of 3DS emulator is that it provides full control to the user so you can create custom profiles, change the interface and do a lot more such stuff with it. The games you get to play will offer high resolutions so that the games can be a visual treat to the eyes and it also provides you with a long-lasting experience. It supports the wireless microphone and different controllers for giving you a realistic experience while playing the games. You can also get the access to the landscape and other portrait modes just by using the feature of auto-rotate. You can find some 3D games that are available on the 3DS emulator. 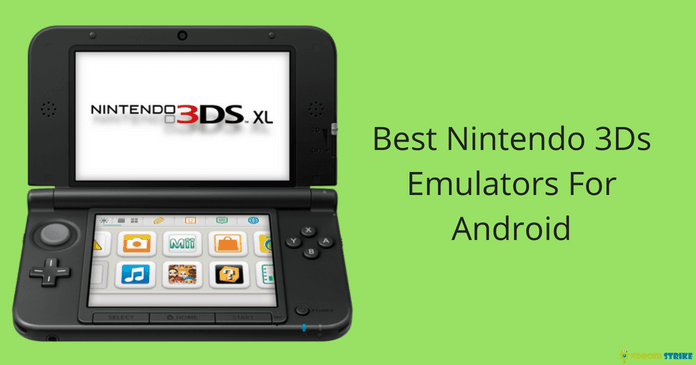 As you get to know about the Nintendo 3DS emulator, now let us have a look at the best 3DS Emulators for Android so that you cannot resist the awesomeness of these 3DS Emulators. Also, Take a look at iOS Emulator for Android; To Run iOS apps on Android Phone. Currently, Drastic is one in the entire premier normal Nintendo 3DS particular person app which is the most stable emulator that is available in the market. This app provides variant choices in it, and it also lets you have the cheats and ways to have an edge. With the help of this 3DS emulator, you can win the games easily. If you choose to use this, then you can enjoy some high-end graphics rendering on this emulator. Though the price is bit high, overall it is a good and worthy emulator. This is another new emulator that has been introduced into the family of Nintendo 3DS Emulators, and it is one of the best emulators for Android APK so far. This works great for the phones which have spotty memory problems as it is a mid-range phone that can work as low as the 2MB and the quad-core processor. The game which is compatible with this emulator is RAR, Zip files, 7z, and NDS files. You can get this emulator without paying a single penny, but the only requirement here is that you need to have a high tech latest device. MegaN64 is the advanced version of Mupen64+ which is an openly provide venture. It is one of the best 3DS Emulators for Android that is formed from the other emulator apps. This emulator modifies the primary code to create more efficiency to the games. Modification embraces the particular telephone enhancements for advances telephones like Google element and Samsung Galaxy S5. Hence, this is jam-packed with all the features of the other Emulators and works reasonably well in all the devices. This emulator has been in the market for a while, and it is available at free of cost. Although it has a few issues, the developers are continuously working on it to make it better. The essential features of this emulator include along with performance tweaks saving and loading states, skip of frames to logically help games play faster and smoother with good speed. This emulator is an open source that consists of all the features and controls which requires for the gaming to happen. It includes a lot of system availability like Play Station, SNES, Game Boy, and Nintendo DS. This emulator is a bit more complicated than the other ones because you have to download some particular games to play. The app is straightforward to make use of, and you cannot find any annoying adverts. You can download this emulator for free, and it is an excellent emulator even though some negligible issues are there. GBA Emulators comes with the gaming boy advanced Emulators which can help you to have the best experience in the list of the 3DS Emulators. You can easily find this app in the play store is supportive of all the apps even to the oldest of the Android versions. Hence My boy works excellent for all the cell phone devices and ultimately becomes a must try. How to download 3DS Emulator for Android? Now that we have known the types of the 3DS Emulators it is essential to understand the downloading process of these apps and get a step closer to the gaming experience that the Nintendo 3DS offers. First of all, you need to make changes in the settings of your mobile phone device so that it can accept the download and installation of 3DS Emulators. To do this, you have to follow the steps mentioned below. Go to the settings and select security settings. Click on apps management and enable from unknown sources. After you complete the process of the settings, you can download the 3DS Emulator APK file. You can download it from the Google Play Store. After completion of the download, you will find the file in the files manager of your device under the download section. Click on the install button and launch it on your Android device. So, you get to know how you can get the download of the 3DS Emulator for Android. You can play the games hassle-free without any interruptions caused in the other apps. This emulator is accessible to all the devices be it any of the brand or the Android configuration. These are the standard steps to download the emulator and devoid of any of the circumstances. If your emulator is not functioning under extreme condition, then it is advisable to download and reinstall the 3DS Emulator app just to make sure that there are no glitches involved this time. How to use 3DS Emulator on Android? After the installation of the Emulator through the 3DS Emulator Android APK file, you can now make use of the search bar to find more games. As we know that Nintendo games are the ones which everyone likes to play. So search for your favorite Nintendo 3DS game and play it while enjoying the game. For this, you need to search the game on the search bar, and you will find the list of the games. Choose your game and enjoy playing. From the above, you have known about what is the purpose of 3DS emulator and why Nintendo, features, how to download and use it. Don’t you find it easy and beneficial to you? Then what are you waiting for? Go ahead, and start downloading the fantastic Nintendo 3DS Emulator to get the great experience while playing your favorite games.